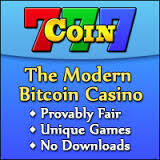 777Coin Casino - huge range of gaming! As you can imagine we at Bitcoin Casino Sites love our gaming sites, especially when it provides us with a huge range of games and the ability to wager with our favourite cryptocurrency. It’s because of this we’d like to introduce you to 777Coin Casino who state that they ‘pride themselves on having the most unique and entertaining games of all the Bitcoin casinos; sounds good to us! When you add in the fact that 777Coin Casino have provably fair games, because they use the latest cryptography to mathematically prove each and every game’s result are fair; then I’m sure we’ve really perked your interest. Accept a range of cryptocurrencies. When it comes to games then 777Coin Casino have plenty for you to choose from and pride themselves in offering you the most entertaining crypto games around. So whether you’re a table games, card games or slots fan then you’ll have plenty to choose from; with our casino favourites Blackjack and Roulette being a must. For those of you new to Bitcoin and other cryptocurrency, all you need to do is open a wallet to store your currency. For buying Bitcoin we recommend Coinbase, an organisation which specialises in cryptocurrency and offers a wide range of facilities to accommodate all of your needs. For the high rollers out there you’ll be welcomed by 777Coin Casino in style. Their games support higher bets than most with up to 100mBTC maximum on Roulette, 50mBTC for Blackjack and 125mBTC for Satoshi Slider. If you’re new to cryptocurrency and aren’t sure about the various units then let us help out; one Bitcoin is equivalent to 1,000 mBTC. To ensure your entertainment and currency is secure 777Coin Casino offer a two factor authentication process, where if you have a smartphone or tablet you can add in an additional password. 777Coin accept a number of cryptocurrencies which include Bitcoin, Litecoin, Dogecoin, Darkcoin and Altcoin. So if you’re ready for an incredible gaming experience on an ever growing and improving industry favourite then simply CLICK HERE and we’ll take you through to register.